Global virtual teams (hereafter: GVTs) are one way, to respond to those trends and stay competitive. Several surveys indicate, how ubiquitous global virtual teamwork is. A survey from 2016 included 1,372 respondents from 80 countries. 85% of those indicated that they already worked in GVTs. To be successful, these teams depend on diverse factors, as can be seen in figure 1. Fig. 1: Success factors of global virtual teams. One of the main difference between GVTs and co-located teams is the interaction through information and communication technologies (hereafter: ICTs). The most important success factor, yet biggest challenge for those teams is to develop mutual trust. This paper will connect both success factors to find out, how trust can be built through the appropriate usage of cutting-edge ICTs. How to build trust is one of the most researched topics in the GVT literature. In addition, scholars already included trust-formation through communication in their research. However, they have not broadened their research to emerging ICTs, like Web 2.0 or virtual rooms yet. Scholars annotate critically that even though those technologies are already used in practice, “research appears not to be keeping up with practice.” Regarding 3D virtual environments like virtual rooms, only five articles were found by Gilson et al. and the content was rather generic. Additionally, social networks, which are broadly used in practice, have yet not been focused within the scientific literature. The scholars recommend to addressing these topics in future research. Therefore, this paper starts to fill this scientific gap by developing assumptions regarding the formation of trust through new ICTs within GVTs, based on theoretical background. The results can be used for further research that verifies these assumptions practically through experiments. The main goal of this paper is to analyze how modern ICTs as well as communication behavior can enhance trust within GVTs. To set the frame and emphasize the relevance of GVTs for organizations and Human Resource (hereafter: HR) departments, chapter 2 begins with a short definition of GVTs and their strategic importance based on current mega trends. In chapter 3, trust, as the main topic will be discussed. Starting with a short introduction, Mayer et al.´s Proposed Model of Trust will form the theoretical basis and swift trust, which is a typical form of trust in GVTs, will be defined. Moreover, it will be illustrated, why gaining trust is such a challenge for GVTs. Chapter 4 analyzes, how trust can be developed using modern ICTs. Communication behavior that enhances trust will be considered and finally the cutting-edge ICTs Web 2.0 and virtual rooms will be presented and evaluated regarding their potential to build trust within GVTs. With HR as the main target group of this paper, chapter 5 gives implications for how HR can enhance trust within GVTs by providing the right technical framework and, on a more strategic level, change the organizational culture and drive the digital transformation. Finally, chapter 6 summarizes the key aspects of this paper and gives implications for further research. Figure 2 gives an overview of the research questions that will be answered within the different chapters. Fig. 2: Structure of the paper and research questions. This theoretical paper is based on a narrative literature review and builds hypotheses based on existing research and theories to offer a basis for further research. The research process, literature sources and searched teams are illustrated in figure 3. Except the literature that was used for the theoretical basis, the researched articles do pre-date the year 2004, however, the majority of used literature does not pre-date the year 2011 to cover the latest scientific findings. Fig. 3: Process of narrative literature review. This paper will only answer the abovementioned research questions with the intent to find out how trust can be developed in GVTs through modern ICTs. Except trust and ICTs no other challenges or success factors of GVTs will be addressed. GVTs can appear in various forms of virtual or real-life interaction, some of them still have limited face-to-face contact, whereas others totally rely on ICTs. Since this paper focusses on the virtual interaction via ICTs, only GVTs that exclusively interact virtually are in scope of this paper. Additionally, the history of GVTs, what kind of leadership style is applicable, or under which circumstances they are useful, will not be discussed. The main target groups of this paper are HR on the practical side and scholars on the scientific side. Therefore, practical implications for HR will be given. No practical recommendations for leaders of GVTs will be included. This paper does not include self-conducted experiments and can therefore only be used as a theoretical basis for further research. The following chapter will set the stage concerning GVTs and their strategic importance for organizations. First, a short definition of GVTs will be given. Then, current mega trends will be presented to emphasize the necessity of GVTs and how their work is influenced by changing work environments and technologies. 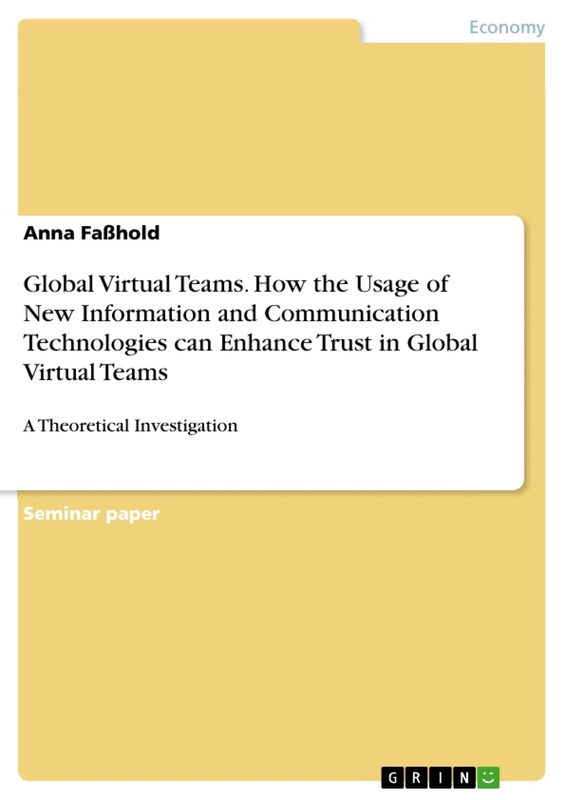 In the literature, global virtual teams are defined as a group of at least two geographically dispersed members who work interdependently across time zones, space and/or organizational boundaries and collaborate via digital ICTs to complete an organizational task. Depending on their dispersion, they are more or less culturally diverse. Mostly, GVTs are gathered to accomplish a specific project only and therefore, often work together for a limited time-span. Synonyms that are used in the literature are virtual project teams, or on a broader level, virtual organizations. Their way to work can be defined as rather self-directed and self-controlled than authoritarian and externally controlled. Global organizations are currently in a state of radical change. Due to proceeding global distribution of organizations as well as emerging technologies and tools for social collaboration, GVTs became a vital success factor for many multinational companies. In Deloitte´s Global Human Capital Trends Survey of 2016, 92% of more than 7,000 respondents worldwide ranked the organizational design “network of teams” as highest priority, as can be seen in Figure 4. Besides the abovementioned mega trends, there are other influential trends that support the strategic importance of GVTs. To attract and retain a wide range of talented employees within the demographic change and war for talents, global companies need to address employees from all ages. On the one side, models need to be family-friendly and age-appropriate to attract aging staff. One the other side, global companies have to attract Millennials, who ask for more work-flexibility. According to The 2016 Deloitte Millennial Survey (see figure 5), 75% of the 7.700 interviewed Millennials from 29 countries would like to work remotely, with only 43% of them having the opportunity to do so. Since GVTs offer that kind of flexibility and enhanced work-life-balance, they can offer a competitive advantage for multinational companies by attracting this target-group. Besides the flexibility, employees can benefit from other advantages that are connected to virtual decentralized teams, for instance, flat hierarchies, increased opportunities to make their own decisions and self-organization. The abovementioned trends can be summed up as work 4.0 in which HR will be the main enabler for the needed digital transformation and cultural change. Tidd, cited in de Kare-Silver , p.65. cf. Global Human Capital Trends Deloitte , p.6. cf. Global Human Capital Trends Deloitte , p.9. cf. RW3 LLC CultureWizard , p.3. cf. own graphic based on Akin (a), p.17. cf. Gilson et al. , p.9. cf. Jarvenpaa/Leidner , p. 794ff. Gilson et al. , p.14. cf. Gilson et al. , p.14f. cf. Döring/Bortz , p. 145.
 cf. Baumeister/Leary , p. 311f. cf. Dulebohn/Hoch , p. 569.
 cf. Snellman , p. 1255.
 cf. Ouye , p. 1.
 cf. Bersin et al. , p. 4. Bersin et al. , p. 10.
 cf. Bersin et al. , p.4. cf. Ouye , p. 2.
 cf. Abbatiello et al. , p.9. cf. Hofmann , p. 218.
 cf. von der Oelsnitz/Staiger , p.259.